At the time, I was pissed off about it, because I took school very seriously, but it ended up great. It was a super easy class, I got a Food Safe certificate for taking it (necessary if you want any kind of food services job in my hometown), I learned possibly the only practical things I learned in all of high school, and on double-block Wednesdays, I’d have banana bread or whatever to share with my friends at lunch. One week we learned to make pasta from scratch. And it was Amish-style. We rolled out that dough with rolling pins. I don’t know if you’ve ever made pasta, but pasta dough is tough. Rolling it thin enough to make noodles takes time and muscle. It turned out really tasty though. And then, once we all had carpal tunnel, the teacher says, “Or you can use this pasta roller thing.” And she shows us this tool which cut the effort to a tenth of that needed with the rolling pin. (Thanks, lady. Could have used that information before.) 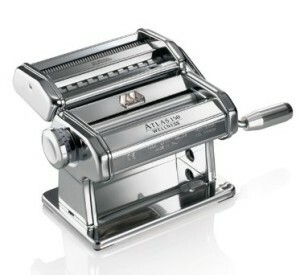 I resolved that when I moved out and got my own apartment, I would get one of these things and make the best pastas ever. All the time! Screw the iPhone. This was my aspirational gizmo. But when I moved out, it was to a dorm in New Brunswick that didn’t have a kitchen. And then furnished apartments in Dublin, Puerto Vallarta, Brisbane, and Melbourne, where I was attempting to keep my worldly possessions limited to what fit into my wheelie suitcase. Even when we moved to Vancouver, it wasn’t supposed to be for all that long, so while I still thought about wanting that machine, I didn’t buy one. About a year and a half after moving here, I was working at my current job and it was near Christmas. At the time, the done thing in my office was one of those white elephant secret Santa things, with the rule being that the present you brought was a re-gift of something you’d been given in the past – you couldn’t buy anything to bring. And wouldn’t you know – one of the re-gifts was a pasta roller! Brilliant! So I worked the stealing system in that game and made it mine. I couldn’t wait to make some fresh pasta! So I brought it home and put it in the cupboard. And didn’t make pasta. We moved three times and each time, my husband wanted to know if I was ever going to use this thing. “Totally,” I’d say. But the longer I put it off, the more intimidating the task seemed, so I kept not doing it. Well my friends, here we are six years later (or 17, if you want to look at it that way), and I have done it. I made fettuccine the other day. 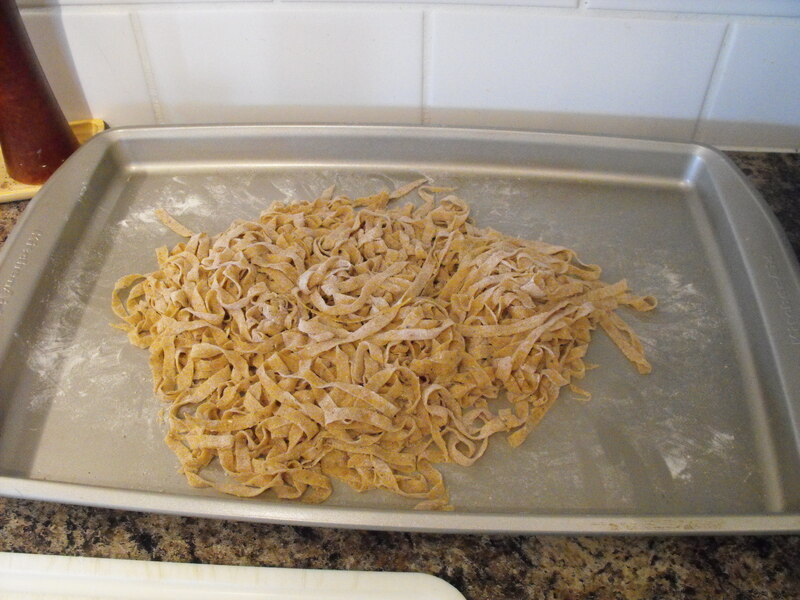 Black pepper whole wheat fettuccine with a recipe from this girl’s blog. It was brilliant. (I went with a puttanesca sauce, if you’re interested.) It was also way easier than I’d built it up to be in my head. Because really, when you put off anything that long, it’s always going to be worse in your head. There’s quite a lot of personal satisfaction in making things from scratch. The product is good, it’s generally healthier than what you’d buy, you usually save a bit of money, and you get to pretend to be all domestic goddessy. My friends, I’ll bet that most of you have a contraption like this in your cupboard, be it a pasta maker, or a thing that makes bread, yoghurt, or ice cream. Bust those things out. Let them fill their destinies. It’s a good feeling. « I promise not to turn into a Mommy blog, but this happened and it was kind of intense, so I’m going to tell you about it. Ya know, I took a class, and I actually found rolling it out to be easier than using that blasted machine! I have yet to try it at home, though. (I kind of need a kitchen first.) I have a great French style rolling pin that makes rolling SO much easier than our traditional barrel pins with the sticky-outie handles. Now you’re making me crave fresh pasta… I need my kitchen back!! Huh. Maybe you’re stronger than me. When I did it by hand at home, I got all lazy and made crazy thick noodles. Hopefully your kitchen gets done soon. I had one of those on my wedding registry and was so excited when I got it. Unfortunately, it’s been sitting in my attic for 4 years. It intimidates the hell out of me! Maybe conquering it will be one of my summer projects. It’s actually really easy when you sit down to do it.